Traffic jams prevented emergency crews from reaching the scene of Highway 6 accident on time. The fatal accident on Highway 6 Sunday took place after a full-trailer truck stopped at the side of the road. The right side of the bus that was involved in the crash struck the left side of the truck, and the side of the bus was shaved off, according to Lt. Col. Noam Bagiensky, Head of the Accidents Section in the Police's Traffic Department. Magen David Adom Director Eli Bin said Sunday that emergency crews encountered severe delays as they made their way toward the scene of the fatal accident. Israel's emergency services are among the most experienced in the world in dealing with situations where numerous people need medical evacuation, largely because of the numerous wars and terror attacks the country has experienced. Four people were killed Sunday morning and another 30 were injured in a collision between a bus and a truck on Highway 6. Ten of the injured suffered moderate-to-serious injuries, and another twenty were lightly wounded. 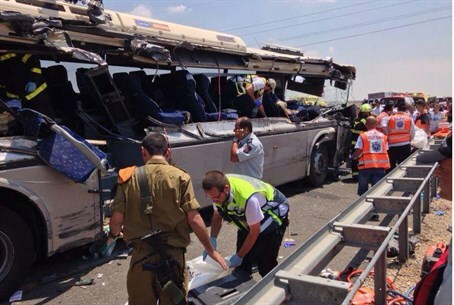 The accident took place between the Sorek junction and Kiryat Gat, and was declared a mass-casualty event. Dozens of paramedics from both MDA and Ichud Hatzala arrived at the scene to assist the injured. An IDF Yassur helicopter flew two people with serious injuries to Hadassah Ein Karem Hospital in Jerusalem. Another helicopter took two of the injured to Soroka hospital in Be'er Sheva, while ambulances took one person with serious injuries and another with moderate injuries to Kaplan Hospital in Rehovot.